It is all about relationships! The success of our infant program starts with a trusting relationship with our staff for both child and parent. Infants trust their needs will be met when they have a consistent and responsive relationship with the adults in their lives. 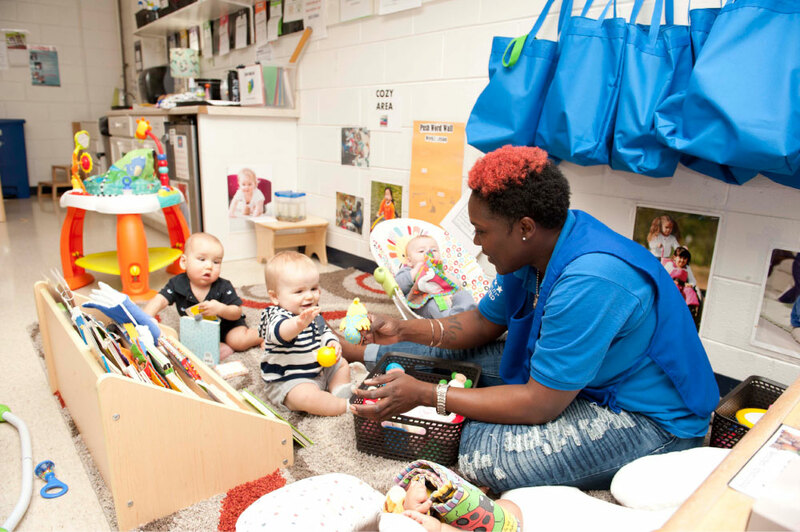 The infant program at DHCDC is highly responsive to the individual needs of infants so that they feel safe and confident to explore and learn about their world. We keep group sizes small – eight infants per group. Our teacher-student ratio is 1:4 for the infant program. Everyday experiences shape early learning. A child’s academic success later in life can be traced back to how many words are spoken to them in their first three years of life. We talk, read, play, and learn all day with your infant. In the classroom, our infants interact with their highly-qualified teachers and each other throughout the day in small group sizes. Our infants are exposed to environments rich in language and literacy, opportunities to engage in science through exploring nature, messy play, and testing out hypotheses. They also begin the basics of mathematical reasoning, spatial reasoning, and counting. Our teaching staff develop lesson plans based the children’s current development and the Georgia Early Learning Development Standards for children birth-12 months. We provide a warm and loving environment filled with stimulating and developmentally appropriate academic experiences. Through the focus and attention of our teaching team your child will flourish in our infant program! My son has been enrolled at DHCDC for four years. When we left him in the infant room at age 6 months it was hard, but it was also evident that he had loving, dedicated teachers. We quickly felt at home and he did too. In his time at DHCDC, he’s developed emotionally, cognitively and physically. He’s a happy, confident little boy. . .We’ve loved our DHCDC experience.